Especially when it comes to the cats! The outside cats have been taking advantage of having access to the sun room a lot. 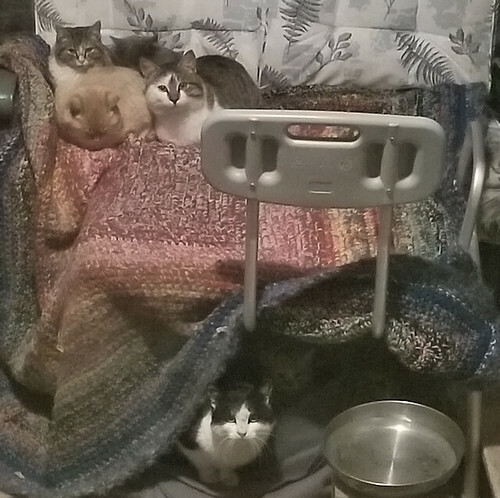 They clearly prefer it to any of the other shelters they have access to around the house and outbuildings, and even the dad cats are showing up in there more often. It still gets really cold in there, and while the water bowl heater we rigged up is working very well for keeping the water from freezing, it’s not creating any of the radiant heat by warming up the cinder block, as I was hoping it would. It’s just too cold for the light bulb to make a difference. My husband and I have discussed putting an actual heater in there, but aside from the safety concerns, and the impracticality of heating up an uninsulated room of that size, the reality is, if we warm things up too much, it will actually harm the cats. They must be exposed to enough cold for them to develop their thicker winter fur. If they don’t, they would be much less able to cope with the cold and more likely to be hurt by it. The radiant heat from the water heater would have been the happy medium, if it had worked that way. Having a thick blanket that will conserve their body heat while they bundle up on the swing bench helps a lot, but this is still a big open space, so a lot of that body heat gets lost in the room itself. So we were trying to figure out a way to make a “cave” that they would actually use. In such an attempt, my husband brought my dad’s old transfer/bath chair into the sun room. The thought was to eventually find a way to put it over or on the swing bench itself, to great a “cave”, but at first, he set it up to give them a chance to get used to it being there. This is what we could see from our bathroom window, a couple of hours later. Not only are the kittens okay with it, with Nicky the Nose (who has very recently started joining the kitten pile), even Ferdinand hunkered down under the transfer chair. These are the two that have been fighting! I hadn’t realized one of the kittens was under there with Ferdinand! I think that might be Bob. My dad really loved the outside cats, and they loved him right back. I think he would be just tickled pink that his favourite seat, and now his transfer chair, are being enjoyed by the cats! ← The Things we Find: an early version? Please do leave a comment! I find your words insightful!